Street Trees are an important City resource and receive some protection in the form of city tree ordinances. Street Trees are those trees that grow in the right-of-way between the street and the sidewalk, They serve as a buffer between transportation and residential activities. They filter stormwater, reduce the effects of car emissions, increase property values, calm traffic, provide wildlife habitat and regulate summer temperatures. If your street tree is declining or in poor condition and you don't know why or you need advice about your tree, you may contact Urban Forestry for a free street tree health inspection by submitting this inspection application form or filing out an online application form. An Urban Forestry Tree Inspector will visit your site and counsel you on an appropriate course of action for your tree. The Portland Street Tree Inventory Project is designed to empower neighborhoods to care for this city's significant urban canopy. Portland's Tree Inventory Project began with a pilot project in 2010. Since then, twenty-six neighborhoods have partnered with the Urban Forestry staff of the Portland Parks and Recreation Department to create tree inventories and action-oriented Neighborhood Tree Plans. In 2015 Irvington was one of twenty Portland neighborhoods selected for a Street Tree Inventory. In the previous four years, volunteers identified, measured and mapped more than 100,000 street trees. Not bad for a city once known as Stumptown! Irvington is fortunate to have some of the city's most remarkable street trees. On many blocks, they create a true canopy over the street that is one of the joys of life in a historic neighborhood.. Some street trees are also unusual or distinctive species that highlight the breath of arborcultural diversity in our area. Older neighborhoods, such as Irvington, present certain challenges for street trees. Overhead wires, bus and truck traffic, sidewalks and narrow planting strips may impact your street tree. If you are planting a new street tree, be sure to check the City of Portland approved street tree list. You may also want to contact the non-profit group Friends of Trees to find out when they will be offering tree planting services in our neighborhood.. Team leaders took tree identification training. 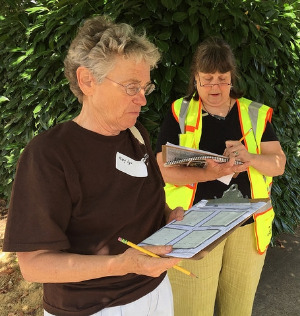 Dozens of volunteer data collectors for Irvington's Street Tree Inventory Project walked the neighborhood in summer 2015. On four different inventory days, about 10 inventory teams each with two or three volunteers surveyed one quadrant of the neighborhood.. They were assisted by arborists cycling between teams offering additional expertise. Additional volunteers helped the City to collate the data. The report on the Irvington Street Tree Inventory lays out many opportunities for planting new trees and for greater diversity of trees in the neighborhood. Heritage Trees are trees that have been formally recognized by Portland City Council for their unique size, age, historical, or horticultural significance. The Heritage Tree ordinance became part of the Portland City code on May 19, 1993, and the first Heritage Trees were designated in 1994. There are nearly 300 Heritage Trees throughout Portland. About 10% of these trees are located in Irvington. Impress your friends when you point out the canopy of Caucasian Wingnut trees on Knott Street, or visit the amazing Weeping Cherry on 18th when it blooms each Spring. New trees are added each year, and anyone can nominate a Heritage Tree! Maybe there is one in your yard worthy of this special honor? View a list Heritage Trees in Irvington. Or go to http://pdxtrees.org/ for a free iOS app that lets you explore all the Heritage Trees. The Heritage Tree ordinance calls for the City Forester to annually prepare a list of trees that are of special importance to the City. A group of citizen volunteers visit each nominated tree to confirm the tree species, measure the tree, and determine if the tree meets the criteria. Upon recommendation of the Urban Forestry Commission, the City Council may designate a tree as a Heritage Tree provided the tree's health, aerial space, and open ground area for the root system have been certified as sufficient. Download this form to nominate a tree. No tree on private property can be designated without the consent of the property owner. This consent binds all successors, heirs, and assigns. The annual deadline for nomination is May 1st. It takes about one year from nomination to receive a Heritage Tree designation if the nomination is accepted. Once accepted by Council, Heritage Trees are given a small plaque so they can be identified by the public, and they are listed in the Heritage Tree Database. Since Heritage Trees are protected by City Code, no Heritage Tree can be removed without the consent of the Urban Forestry Commission and the Portland City Council. No tree on private property can be designated without the consent of the property owner. This consent binds all successors, heirs, and assigns. The Heritage Tree Ordinance further states that it is unlawful for any person, without a prior written permit from the Forester, to remove, destroy, cute, prune, break, or injure any Heritage Tree. A permit from the Urban Forestry is required before pruning, removing, inoculating, or doing any other tree work on a Heritage Tree regardless if the tree is in the City right-of-way or on private property. These permits are free and include a consultation by an Urban Forestry Tree Inspector. Visit the City website for more information on tree permits. The City also provides a list of local arborists offering discounts on Heritage Tree work. Before beginning any work on a Heritage Tree, call Urban Forestry (503) 823-4489 to obtain your free permit. A Heritage Tree can only be approved for removal if it is dead, dying, or dangerous. The Urban Forestry Commission and the Portland City Council must formally decommission the tree before a permit can be issued for removal. Call Urban Forestry (503) 823-4489 for more information. What can you do to help protect Portland's elms? All branches must be chipped. Any elm wood that cannot be chipped must be taken to an approved commercial disposal site within 24 hours of cutting. All stumps must either be ground out or debarked within 48 hours of the removal. When removing a diseased elm tree, the trunk shall be girdled at the base with a chainsaw before the tree is removed.